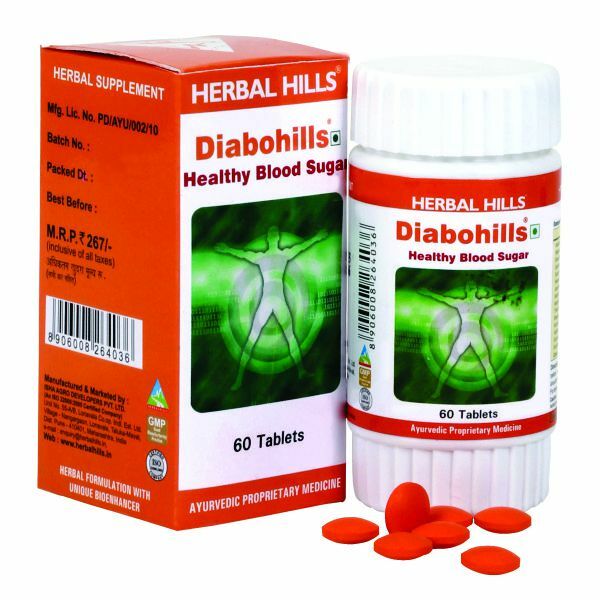 Diabohills - 60 Tablets Healthy Blood SugarDiabohills is a unique combination of herbs that help in managing blood sugar levels, Helps in maintaining blood sugar levels. - Jambu besides its anti-diabetic activity, also helps in alleviating symptoms of polyured & polypepsia. - Karela is traditionally used as a potent anti-diabetic herb. It helps in insulin sensitisation. - Amla & Guduchi being rich in nutrients, its rejuvenative property helpful in supporting protection against diabetic complications. Its antioxidant property helps in providing protection to key organs from free radicals - Gudmar - the name itself is symbolic of its activity. Several scientific papers are published to establish antidiabetic & insulin sensitizing property of Gudmar - Mamejawa is considered to have anti oxidant, Anti lipidemic and hypoglycemic properties.Benefits : - Helps in maintaining normal sugar levels - Helps in maintaining glucose metabolism - Supports normal lipid metabolism.